You might be surprised about the dog and cat diseases that can be found right in your own backyard. 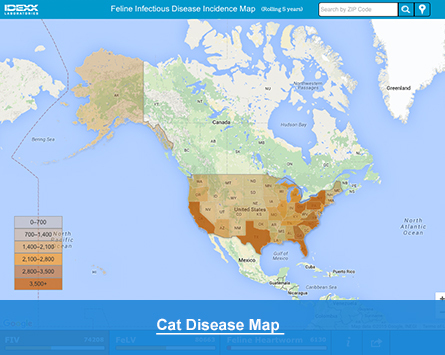 The maps below track dangerous diseases, too often seen by veterinarians. Some of these diseases may be spread by parasites, and some through close contact with other animals. Try out the maps, find out what’s in your neighborhood, and use the links below to learn more. Ehrlichia, Lyme Disease, Heartworm and Anaplasma cases.